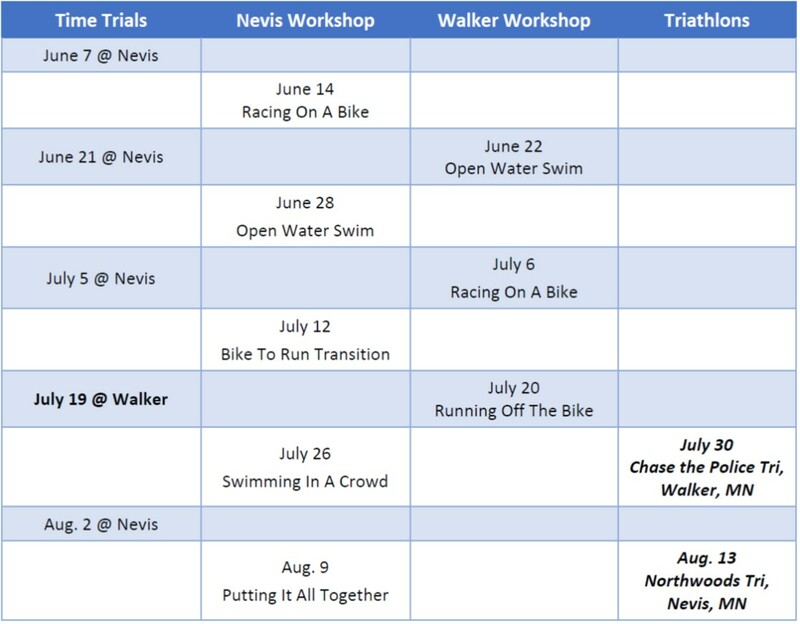 A free workshop series on how to become a more successful triathlete will start June 14th, 6:00 PM at Halvorson Beach in Nevis and on June 22nd, 6:00 PM at Walker Beach. Sponsored by Northwoods Triathlon, Chase the Police Triathlon, Headwaters Triathlon Club, Up North Athletics, and led by Head Coach Neil King. This training series will alternate locations each week from Nevis to Walker. Training focus will be on each athlete becoming a more accomplished swimmer, biker, and runner, and on putting the pieces together. Triathletes of all levels of experience are encouraged to attend. To run concurrently with this training series will be a Headwaters Tri Club Bike-Run workout. A short 8+ mile bike (time trial start, all at your own fastest pace) followed by a short (1-2) mile run. Workouts start Tuesday June 7th, 6:00 pm at Halvorson Beach and are held every other week. The July 19 TT will be in Walker at the beach. Aug 9 – Nevis Workshop, Putting It All Together. 12 weeks total, 16 sessions, all levels are welcome and encouraged to attend, all or some of the events. If you join us at the workshops and the trainings we guarantee you a successful triathlon experience this summer. Who Would Benefit From These Training Classes? Someone asked Coach Neal what the experience level in Headwaters Tri is and who would benefit from these training classes. First let me say that no one in our club is required to attend nor will I be offended if you don’t. However these training sessions will be focused on the middle 85% of intermediate to advanced triathletes. With that said beginners are always the ones to have most to gain. I will not ignore anyone and hopefully everyone will gain some new skill or knowledge. If you are one of our elite level members I might put you to work. Please do encourage everyone you know that will be doing a triathlon this summer to attend. You do not need to be a current club member but I will encourage everyone there to sign up. June 2, 2016 in Education, Events. Coach Neil’s Blog: The Off Season, Part 2 – “Weakness Focus”. ← Coach Neil’s Blog: The Off Season, Part 2 – “Weakness Focus”.